Saturday began a warming trend for Long Island for the next six to 10 days as the region recuperates from the arctic cold, meteorologists said. Residual cold from the polar vortex — which moved from the United States into Canada late Thursday — pushed Saturday's high to 33 degrees, said Joe Pollina, a meteorologist with the National Weather Service in Upton. It was the first time since Wednesday that the thermometer rose above 32 degrees. Saturday's temperatures were about 10 degrees higher than Friday's, with mostly sunny skies. “Day by day, it’s a warming trend,” said NWS meteorologist David Stark. Saturday night will likely be partly cloudy with lows between 20 and 25 degrees, the NWS website said. 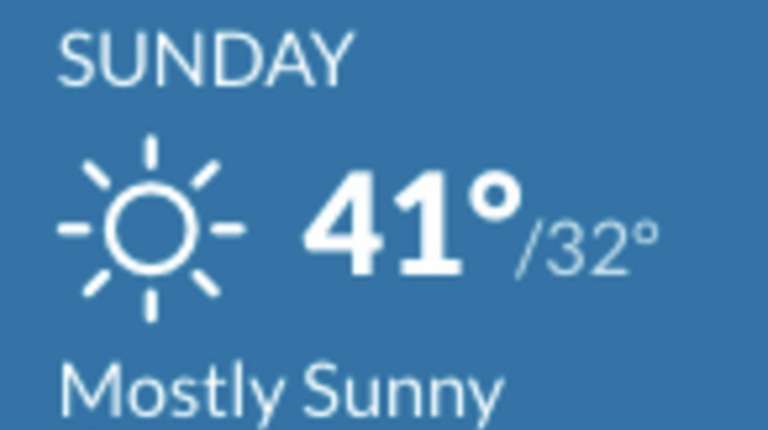 Sunday will bring more sunny skies, with high temperatures in the low 40s before it becomes partly cloudy overnight with low temperatures around 30 degrees, Stark said. By Monday, the high could reach 50 degrees, he said. Tuesday, however, “looks to be the warmest in the mix,” with highs in the mid-50s. Temperatures will dip into the low 30s overnight, Stark said. Wednesday is expected to have highs in the low 40s, which is closer to the normal 38- to 48-degree temperatures this time of year. Malverne Mel and Holtsville Hal's more famous brethren, Punxsutawney Phil, also didn't see his shadow in Pennsylvania. Nor did Staten Island Chuck.